International in reach and interdisciplinary in content, the Journal of Radiation Oncology publishes original research, clinical investigations, review articles, editorials and other articles on radiation oncology. The journal offers a forum for collaboration and exchange of knowledge on management of cancer using radiation therapy. 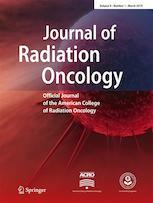 The Journal of Radiation Oncology is the official journal of the American College of Radiation Oncology (ACRO). The Journal presents clinical research into radiotherapy including external beam irradiation, brachytherapy, particle radiation therapy, intraoperative radiation therapy and stereotactic radiosurgery/radiotherapy, and experimental work in radiobiology, tumor biology, radiation physics, dosimetry and radiation treatment planning. Coverage extends to palliative treatment, quality-of-life issues, chemotherapy and surgery. The Journal benefits radiation oncologists, medical oncologists, surgical oncologists, dosimetrists, radiation physicists, radiation biologists, radiation therapists, oncology nurses, palliative care specialists and radiologists and others.